Can you believe there are only 16 days left until Thanksgiving?! While warm, fuzzy visions of time off, family gatherings, food and football fill the minds of many, if you’re the designated chef on Thanksgiving, the tick-tock may have you feeling more distress than delight. Even seasoned cooks can feel a tad overwhelmed this time of year, and if you’re new to cooking or if this is just your first time hosting Turkey Day the pressure may frazzle your nerves like they’ve never been frazzled before. But before you have a total-food-freak-out, just remember – we’re here to help! This year, we’ve launched a brand, spanking new section of our website that’s chock-full of helpful articles, videos and chef recipes. And for Thanksgiving in particular, we’ve compiled a great deal of tried and true information, from how to choose your holiday bird to how to carve it and everything in between. So starting now we’re going to post a new article, video or recipe on this blog everyday until Thanksgiving. Turkey is a very lean and comparatively thin-skinned bird, without the benefit of a goose’s generous layer of fat beneath the skin to naturally protect it from the dry oven heat. Further, when roasted breast up, a turkey’s leanest meat takes the most direct hit from the oven heat for the full duration of cooking. This is why you rarely hear anyone complain about dry dark meat. So, if you simply compensate for the turkey’s thin skin and lack of protective fat, you will be well on your way to roasting a perfectly moist and juicy bird. Oven roasting is a straightforward method of cooking that surrounds uncovered food with indirect, dry heat – which may sound somewhat oxymoronic when looking for a way to cook a tender and juicy bird. However, with a few simple techniques, it is actually quite easy to oven roast a succulent, golden brown turkey worthy of any feast. Every November, the topic generating the most buzz nation-wide is how to roast your Thanksgiving turkey without drying it out. However, a month later when the celebrated Christmas goose takes center stage you never hear another peep on the matter, (pardon our bird pun). That’s because these literally, are two different animals. The simplest technique is to borrow fat from a duck, which like the goose has plenty of quality fat to spare, and our wonderful pure, rendered duck fat is just the ticket for this occasion. All you do is pat the turkey dry with a paper towel, and rub it all over with a generous coating of softened duck fat, before seasoning with a good salt and freshly ground pepper. This fat will help the salt and pepper stay put, and more important, it will help the skin to brown. Not only is browned skin beautiful and tasty, it seals in natural juices during cooking. Roasting with our duck fat will create crispy brown and delicately delicious skin, and it is an especially good solution if you prefer using little or no dairy, such as butter. In addition to protecting with fat, you can also sear the skin to help lock in juices by starting the bird in a 450° or 500° degrees F oven for the first 30 minutes, then reducing the oven temperature to 325° or 350° degrees F for the duration of roasting time. Conventional slow roasting is done at 325° or 350° degrees F for the entire duration. If a particular recipe calls for a specific temperature, there is usually a reason, but for searing, the hotter the better and for general oven roasting both 325° and 350° degrees F are appropriate temperatures. After the bird is in the oven for about 20 minutes, baste regularly with additional melted duck fat, until roasting creates enough pan drippings to baste the whole turkey. Proper and frequent basting will keep the meat from drying out. Baste a big bird at least every 20 minutes, and smaller ones about every 15 minutes because the cooking time is shorter. Remember to baste the entire exposed bird not just the breast. Stay tuned! 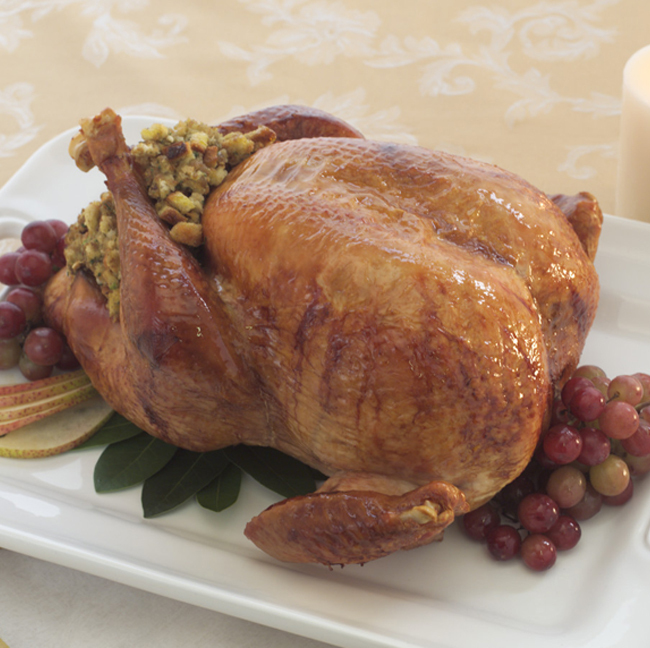 Tomorrow we’ll be posting Turkey Roasting Basics, Part 2. Have questions? Email us, we’re always happy to help.